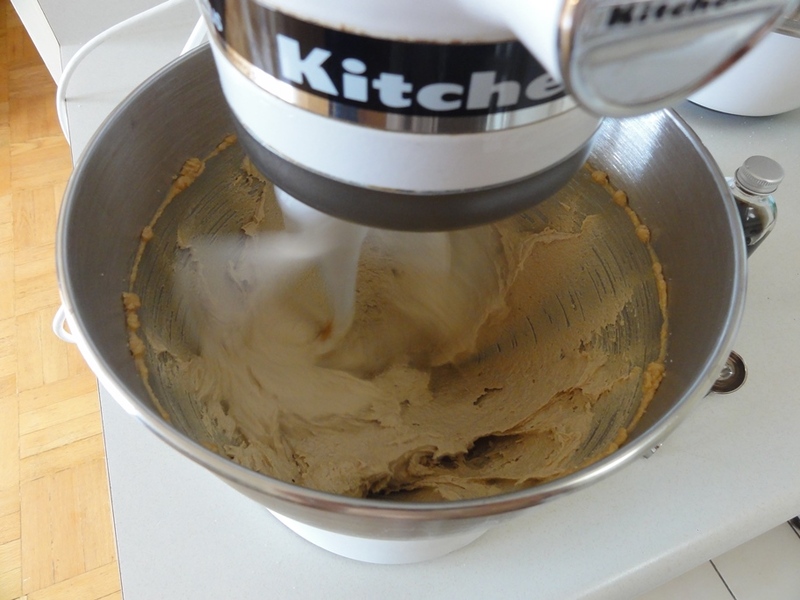 Continuing on the theme of caramel after the Double Chocolate Butterscotch Cookies, this week’s recipe comes from Maria and Josh over at Two Peas and Their Pod. 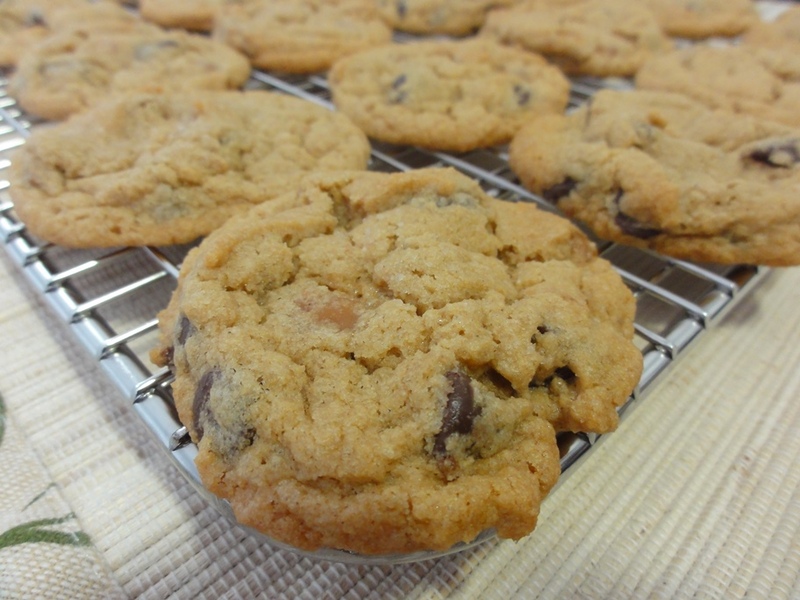 I came across their recipe for Salted Caramel Chocolate Chip Cookies before making the butterscotch cookies, but I’d had some trouble finding caramel chips. Butterscotch chips were not a problem, they were readily available at the supermarket alongside the chocolate chips, but caramel was nowhere to be found in my area and this is a disparity that I think needs serious correcting. In lieu of buying larger caramels and chopping them into pieces I made the butterscotch cookies, which were superb in their own right, and tracked down the caramel chips at a Target as per Maria and Josh’s suggestion. That is still so far the only place I have seen them so I stocked up because I am sure to make these cookies again. 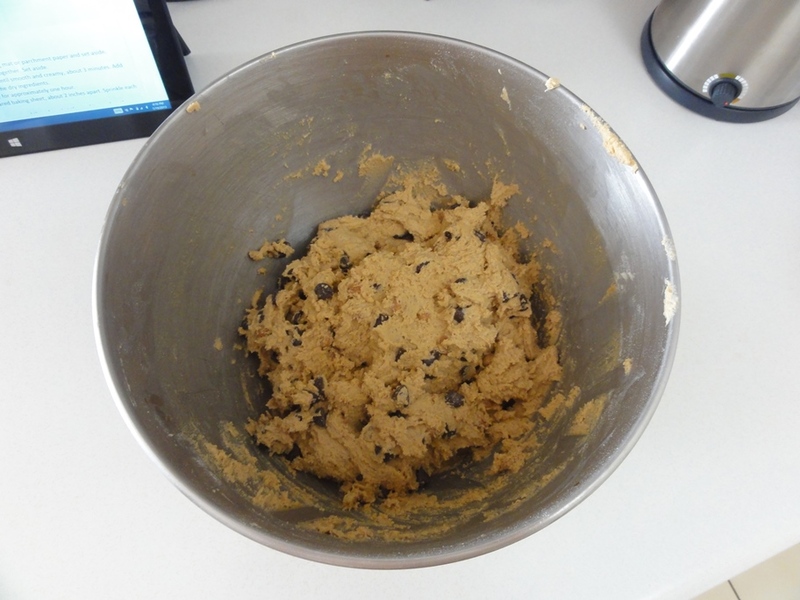 I noticed that the cookies from the original recipe appeared to come out a little flat, and while there’s nothing wrong with a large, flat, chocolate chip cookie, I decided to experiment a little. 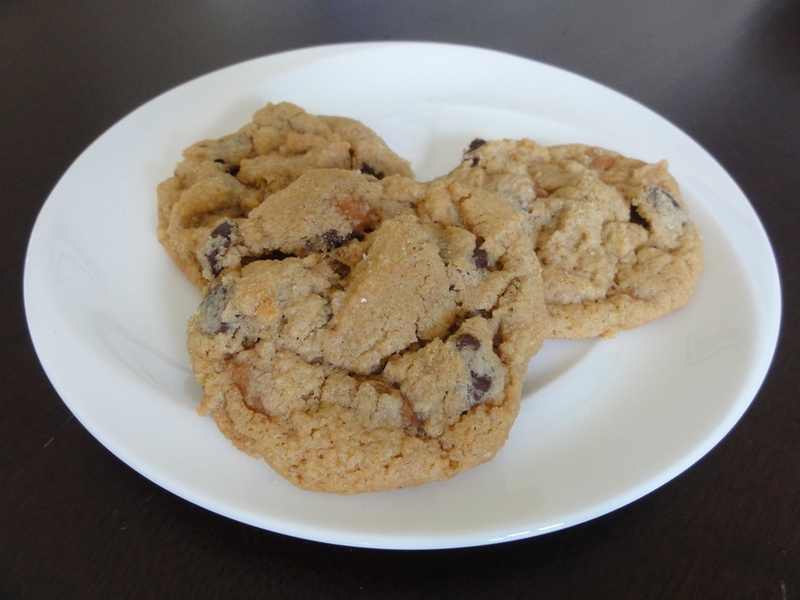 The Oat Chocolate Chip Cookies I made back in May involved chilling the dough in the fridge for an hour, and this was also recommended for the Maple Walnut Cookies to keep them from spreading out too much. I did not think to separate the dough and bake one half straight away while the other chilled for an hour so that I could compare the two, but the end result of my whole batch of dough was that they still flattened out some, but also retained some thickness, so I’m going to call it a success. It may not be an entirely necessary step, but if you’ve got the time it certainly doesn’t seem to hurt them any. The end result was a marvelous, salted caramel version of a Toll House cookie. 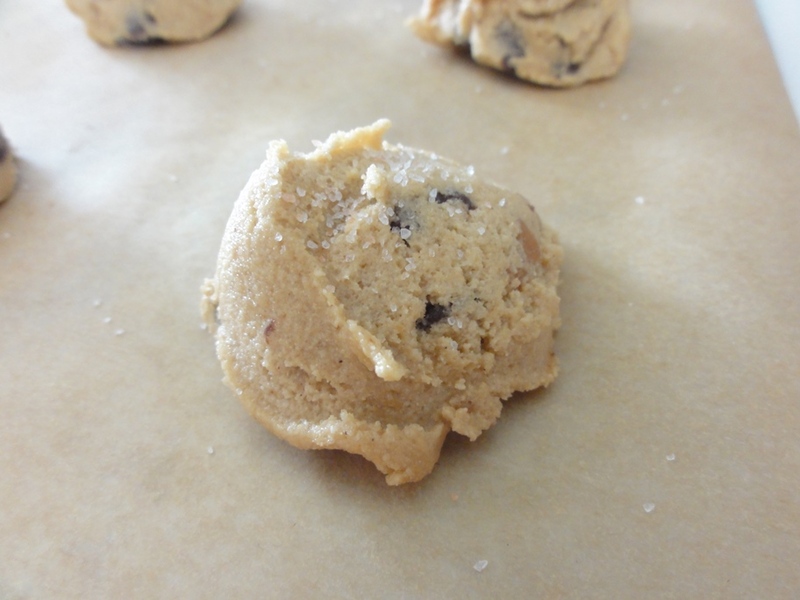 Without the caramel and the salt these would be a wonderfully delicious chocolate chip cookie, but adding the caramel chips and a touch of salt on top makes them even better. Preparation Time: 20-30 minutes, plus 60 minutes in the fridge. 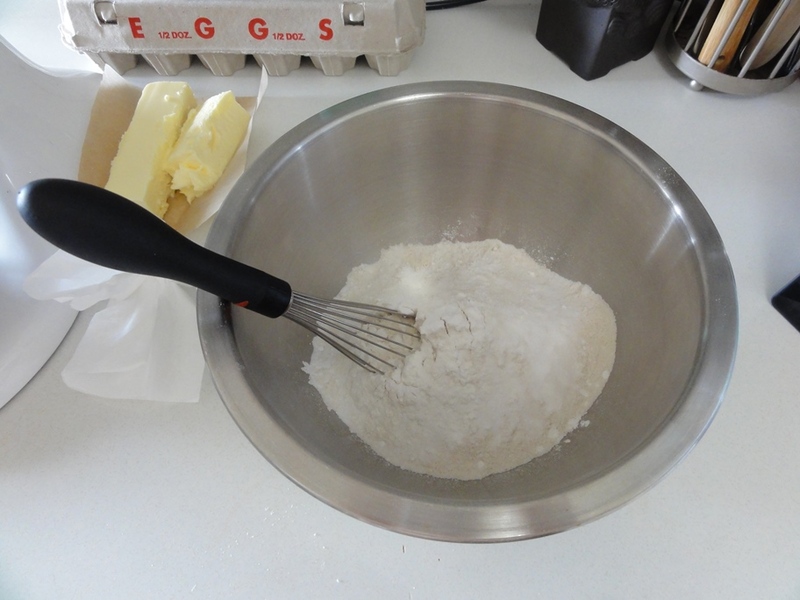 In a medium bowl whisk together the flour, cornstarch, baking soda and sea salt. 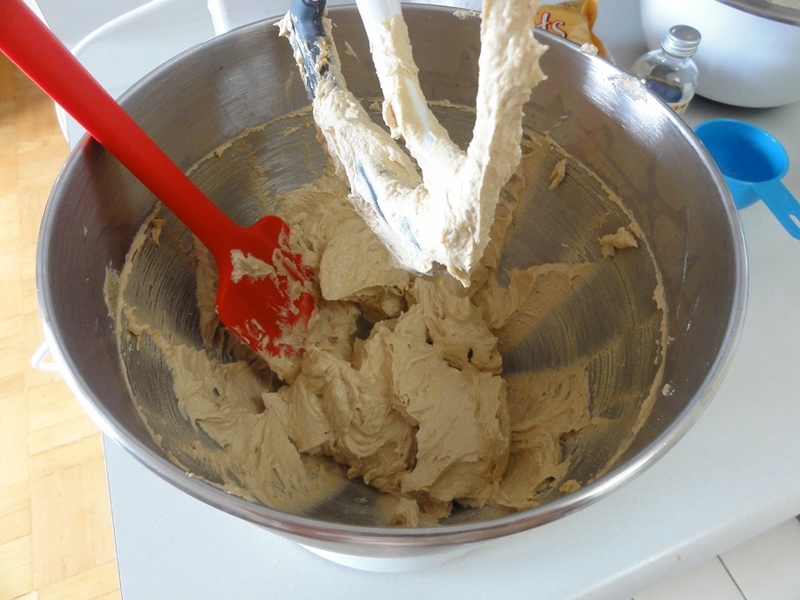 In a large bowl cream together the butter and sugars. Start on low speed and then beat on medium until fluffy, about 3-5 minutes. Mix the egg and vanilla and beat until well combined on low. Slowly mix in the dry ingredients, at most a quarter of the dry between blending until well combined. Fold in the chocolate and caramel chips. 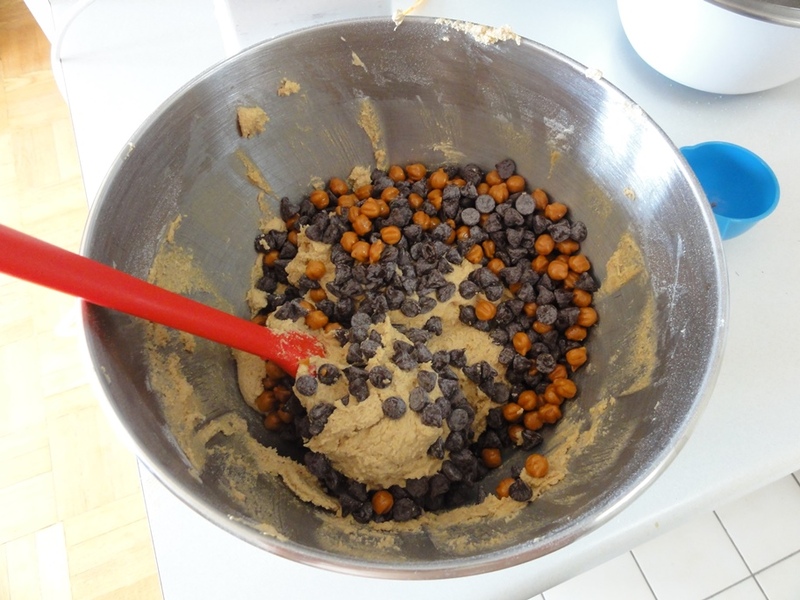 Chill the cookie dough in the fridge for approximately one hour. 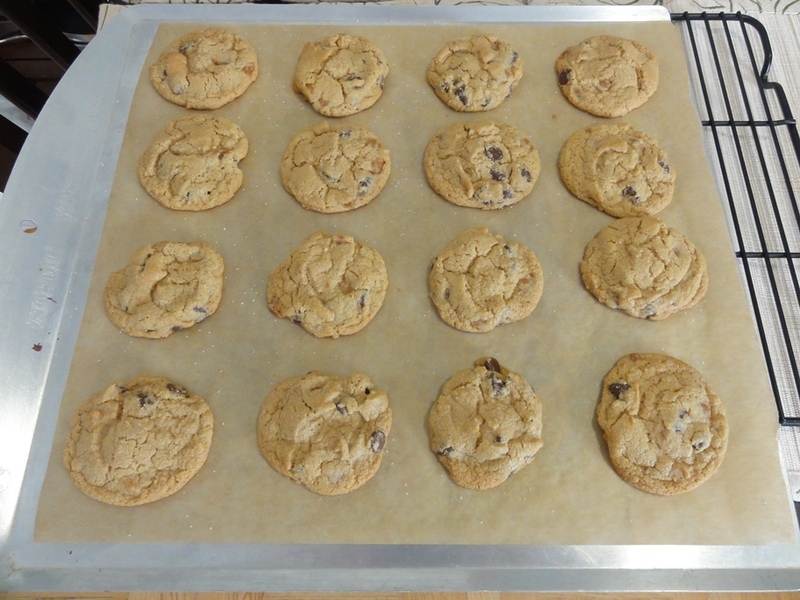 Drop level tablespoons of dough onto the baking sheets, leaving about two inches between each cookie. Sprinkle the top of each cookie with sea salt. Bake cookies for 10 minutes, or until the edges are golden brown. 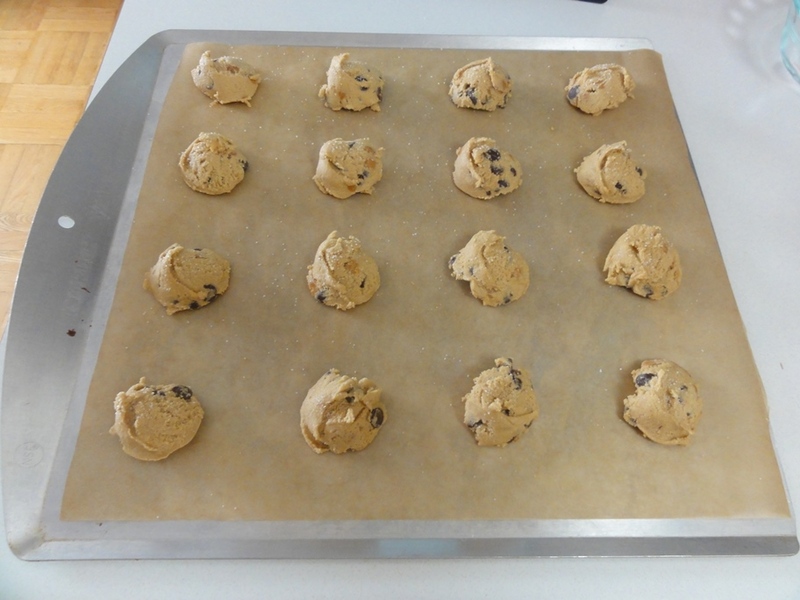 Let the cookies cool for 2-3 minutes on the trays and then transfer to wire racks. As with the butterscotch cookies, cornstarch is involved here once again. The result was the soft, chewy cookie I’ve learned to expect when cornstarch is in town, and that held true straight out of the oven, a few hours later, and even still today a couple of days after baking them. The dry ingredients are awaiting a steady whisking. 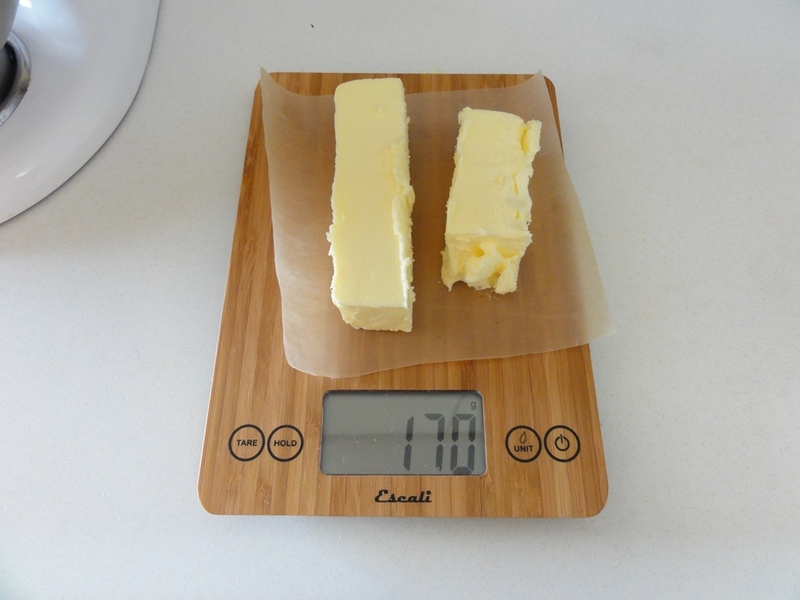 For reference, if like I had you have a very large block of butter that can’t conveniently be measured by its wrapping, 3/4 cup of butter is approximately 170g. 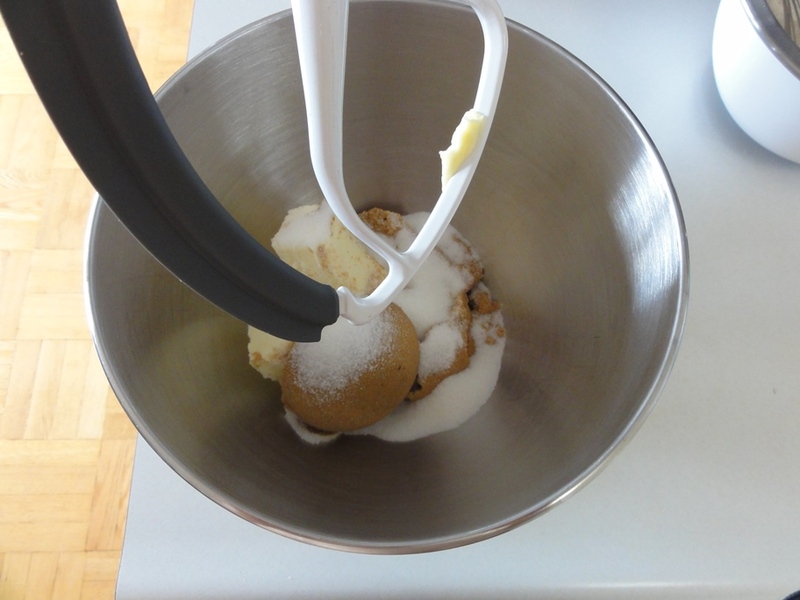 I’m a fan of action shots of the stand mixer. 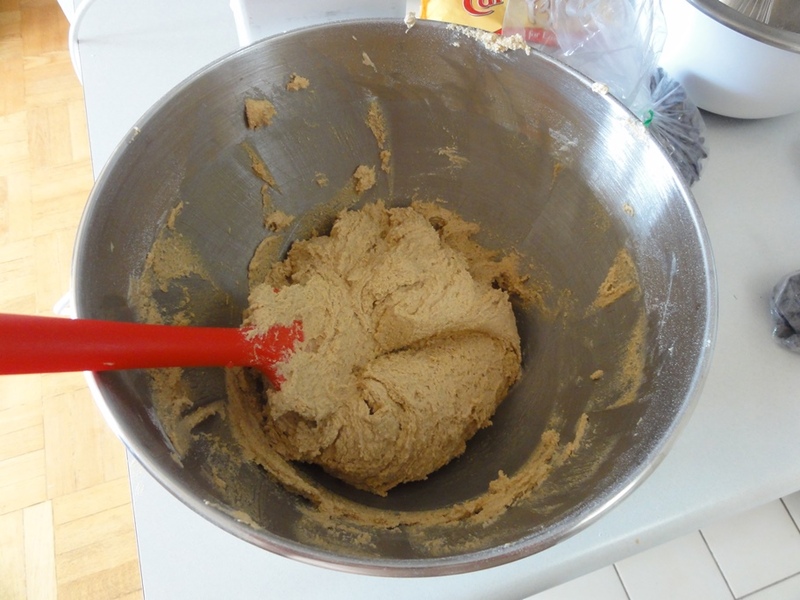 After a few minutes you should have a nice and fluffy mixture, if a little thick. After adding the egg and vanilla things get a little goopy. After the dry ingredients have been folded in the dough may look like this, which is to say a little grainy or dry. That’s okay though, and as long as the dry ingredients have been mixed away and no streaks of flour are left the cookies should be fine. Then you fold in the chocolate and caramel chips; it’s important to eat a few of each for quality control purposes. Now it’s ready for the fridge! The plastic wrap here is just to keep anything else that might be in my fridge from falling in. 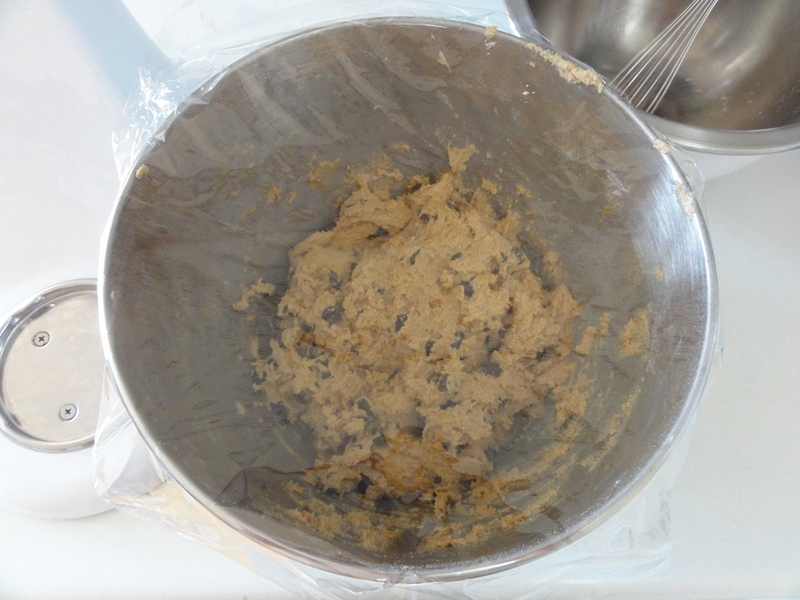 There’s no need to tightly seal up the bowl; the dough can be allowed to breathe. An hour later it looks pretty much the same as when it went in, just more chill. I’d recommend leaving some extra room between these cookies as they will spread out some and there needs to be room around them for proper heat distribution (or at least so I’ve read!). Here’s an idea of the quantity of salt on top of each cookie, and I spread a pinch of salt across every 3-4 cookies. In technical terms a “pinch” of something is 1/16 of a teaspoon, but I used the slightly less accurate interpretation of “how much of something you can pinch between your thumb and forefinger”. Here we have them straight out of the oven, with the parchment paper suitably salted. Last but not least, the requisite close-up of a plate of cookies. Add a glass of milk and you’re all set!